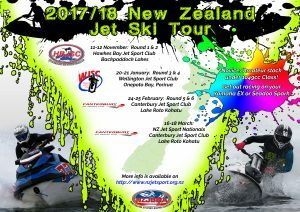 NZJSBA is thrilled to announce that R3 & R4 of the NZ Tour will be hosted by WJSC in Porirua on 20-21st January 2018. With the best Elite Runabout and Ski racers in NZ already committed to the event, it will be a key competition in the build up to NZ Nationals (March 2018 in CHCH). Entry forms and details released soon… including bulk ski transport options available to south Island competitors.